Judd Young, Matinicus Is. 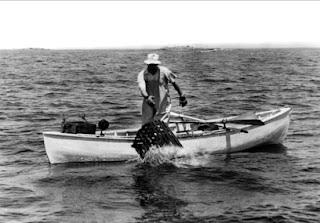 lobsterman, circa 1904. I’ve been thinking for some time now about building a boat for myself that is light and easy to handle solo or with crew, both on shore and in the water; a boat that rows beautifully as well as sails, that is seaworthy, and of course beautiful. 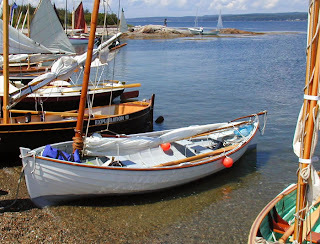 Arguably the quintessential Maine traditional small-craft, the double ender, or “peapod”, as the type is commonly known, was once found all over the rocky islands and ledges of that state’s rugged sea coast. 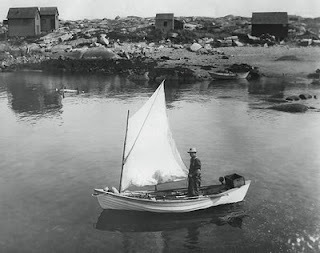 Dating back to the late nineteenth century, the peapod was used in the lobster fishery, primarily to haul traps, but some also served as lighthouse keepers boats, and of course were used for other tasks around the water front as well. A beautiful Jonesport (Washington County) peapod. I photographed this boat at the 2008 Small Reach Regatta. 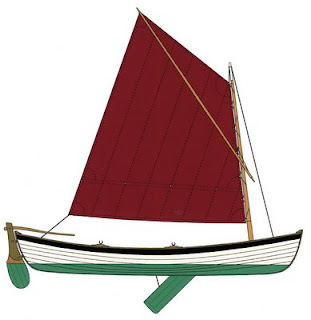 The owner, Charles Chamberlain, told me that this boat was built by the late Alan Vaitses, to lines found in Chapelle's American Small Sailing Craft, page 219 (fig. 83) . She is gaff rigged with no centerboard. Each region produced it’s own model, peculiar to the area and the builder, and the builder’s molds would often be passed down through the generations. The double ender in general, and this model in particular, were extremely seaworthy, and rowed or sailed beautifully. The boat I have chosen to build is a historically significant one, having been built by a prominent family, the Young’s, on Matinicus Island for many generations. This model dates back at least to 1900 or so. Walter Simmons, a Lincolnville (Maine) boat-builder, acquired the molds from Merrill Young in the early 1970’s, and set down her lines to paper so they could be preserved. Walter himself has built many boats from these molds, and also offers the design for sale to other builders (he also offers a wonderful Matinicus Double Ender CD, which is both historical record and building guide). So I bought a set of plans for myself, and have started building her. 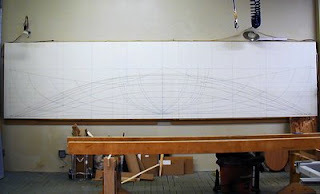 Before the first piece of wood can be cut, the boat must be “lofted”, that is, her lines must be set down full size in three views and faired or “proved”. 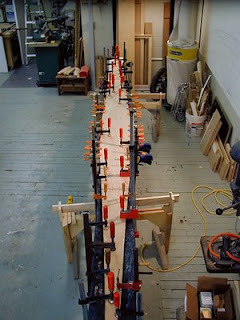 Long, fair strips of wood called battens are used to draw the longitudinal curves, while splines and spline weights or ”ducks” are used to draw the tighter body plan and buttock end curves. Lofting the buttocks up forward. There is a lot of drawing and re-drawing to get all the views to agree. Move a waterline here, it affects a diagonal there, or changes the body curve somewhere else. In addition to the lines, many construction details such as stem profiles, keel widths, and bevels are generated. 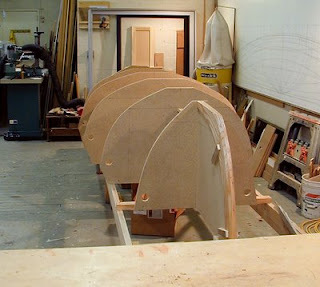 Once the lines are fair, and all views are correlated, the building molds can be lifted from the full size body plan, and the backbone can be built. The lines for this boat show a hull with fairly slack bilges and a moderate rise of floor, which coupled with her hollow lower waterlines, will produce a form that is very easy to push through the water. She will be tender, though, particularly when lightly loaded, and will not have a high top end speed. But she should row effortlessly, and her flare will provide a healthy range of secondary stability. I should point out here that I've added a mold station forward and aft of amidship, as I felt like the original spacing was a little far apart for the Occume planking that I will use. This is not as simple as just erecting new stations within the lofting. The original stations are fair to each other, but not neccesarily fair to the new ones, so I had to go back in and re-check everything, refairing some of the waterlines and diagonals as needed. In the body plan view below, the new stations are shown in blue ink, and extend up to my construction baseline. One interesting note about peapods is that they were often rowed with the rower facing forward and standing up! It is much easier to navigate rocky ledges while looking where you are going rather than where you’ve been. And when it comes time to haul a trap, you’re already on your feet. This requires a long and very strong oarlock, quite different from the normal variety. Walter Simmons made new patterns for these locks, and is having them cast in limited quantities at a foundry in Maine. He sold me a pair, and I’ll be very interested to try them out when the boat is done. I can see myself on some misty, winter morning, pushing through the marsh along with the buffleheads and mergansers. These boats were traditionally built of cedar on steam bent oak frames. The keel and stems were also oak. While many of the double enders were smooth-planked or “carvel”, some were also built lapstrake. The lapstrake boats were quite a bit lighter, though they all were rather heavily built for long service. 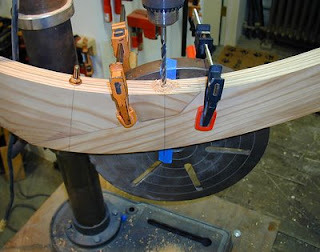 I am building mine lapstrake, but with glued occume ply instead of riveted cedar. I may still use the steamed frames, but I might choose to use more widely spaced sawn frames, joggled to fit over the laps. There are two keel types to choose from as well. 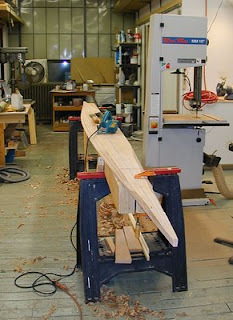 In one type, the keel is set vertically, with the rabbet for the garboard plank land chiseled out by hand. 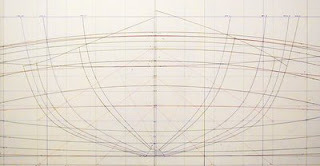 This is sometimes called a “scantling” keel. The other type is the flat plank keel. 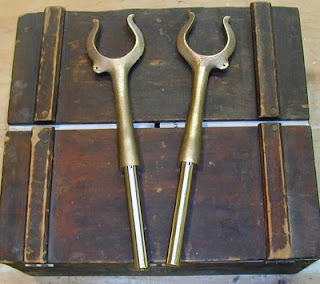 This type of construction is typical for wherries, but was sometimes used for the double enders as well. The flat plank keel is much easier to fit a centerboard to, being quite wide on their inboard surface amidship. I will use the latter, built up from two 12- millimeter layers of occume ply laminated together. There is additionally, another 12mm external shoe, which sets proud of the garboard plank, and brings the backbone structure to a little less than 1-1/2” thick. 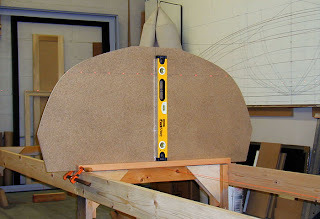 This applied shoe creates the rabbet that would be chiseled in on the vertical keel. Gluing up two layers of 12mm occume for the plank keel. It takes a lot of clamps! 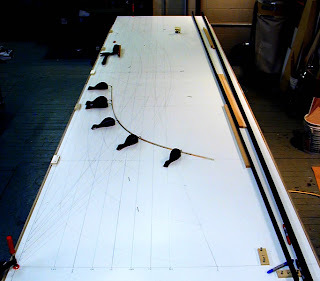 Laying out the keel shape. 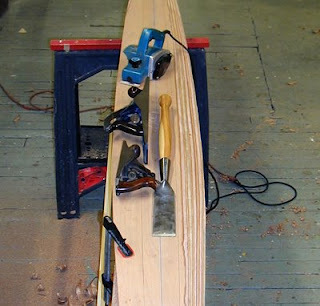 Once the keel has been laminated, its shape must be layed out on both inboard (top) and outboard surfaces. There is quite a rolling bevel to be cut down the length of the keel, with a lot of wood to be removed. I used several different hand tools in the process, but the bulk of the wood was removed with a power plane. Full size stem loftings are transferred to mylar. The stems and their knees are quite hefty. I got mine out of some old construction grade fir that I salvaged from a dumpster. I first made thin ply patterns picked up from the mylar stem profiles, and arranged them on the stock to best advantage, working around knots or other defects. 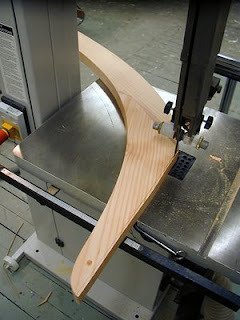 Aft stem and knee are cut to shape on the bandsaw. The knee notches into the stem, and I glued this joint with epoxy. The two pieces are also bolted together with bronze carriage bolts, and the whole assembly will be glued and bolted to the keel as well. the bronze bolts that connect stem and knee. We're ready now to transfer the lofted sections to our mold stock. 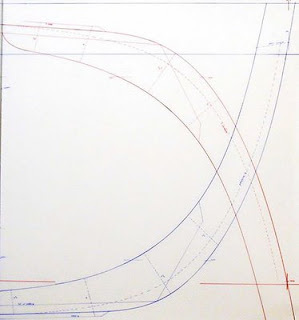 I used mylar again for the transfer, pricking through the lines at intervals with a sharpened awl onto particle board, and then connecting the dots with a batten. I sawed out the molds and trued up the edges with a block plane. I built my strongback from 2x6's jointed carefully and squared up, then screwed to three saw horses spaced about eight feet apart. I use a laser for this procedure, and I like to get the tops of the strongback pretty true before setting up the molds. The vertical centerline and load waterline is marked on all of the molds, and they are then carefully leveled and plumbed, then screwed down to cross spalls set up at the proper spacing on the strongback. There is a string line stretched down the center of the strongback, and the mold centers are brought in line with it as well. The laser dots can just be seen here on the waterline. Some builders carry their stems down to the floor, or otherwise extend them so they can be centered, but I've always used a stem mold screwed perpindicular to the first station mold (and last too in this case). I find it more convenient to set up that way, although the stem mold is in the way somewhat. 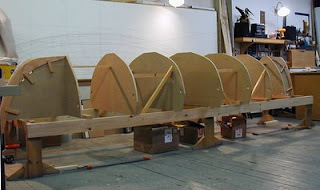 Molds and stems are set up, ready for the keel. 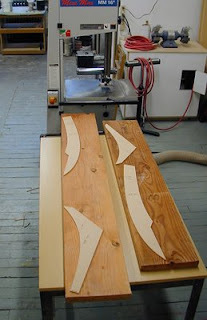 Holes are cut around the mold perimeters with a hole saw to facilitate clamping of the planks. 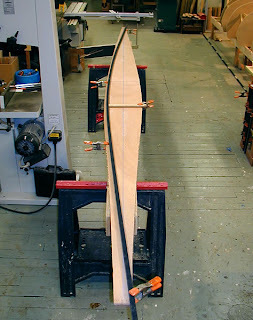 The next step, after the keel is shaped and glued on, is to bevel the molds and check the overall fairness of the set up. Then its time to line off for planks!